A special bit of art for my friend Chelsea. 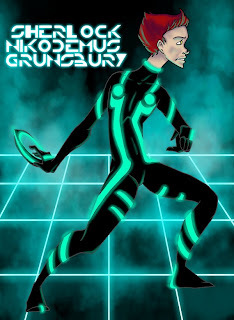 She doesn't really care about TRON, but she loves Sherlock a lot, so I promised I'd finish this one for her. Our cat is very sick, and unfortunately there isn't anything we can really do to help him. I've been a wreck since last night, and Chelsea's been trying her best to keep her spirits up for me and my roommate. I know Chelsea loves Elmer to bits too, and I'm very proud of her for being so awesome when she's probably just as upset as we are. She bought us candies, did the dishes, and has been.. Amazing. I only wish I could be so amazing when my friends were in need. Thank you Chelsea, thank you so much.